Many pre-made canoe dollies are available, but the price can be can be much less if make your own. Using materials at hand will keep the cost even lower. 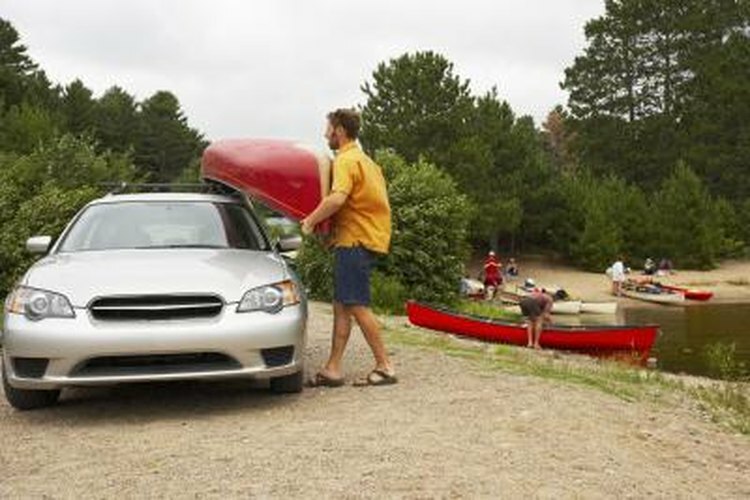 The advantage of a canoe dolly is that it makes moving the canoe over land much easier. This is especially important if you want to move all your equipment such as paddles, vests, fishing gear and an anchor all at one time. Consider the kind of terrain you will need to pull your canoe over. If it's relatively flat, such as a road or well-traveled path, you might be able to get away with smaller wheels. If you'll be moving your canoe dolly over rougher ground, across a woods trail, over rocks and tree roots or anything else that might catch and hold the canoe dolly back, consider larger wheels in the 10-to-12-inch range. These larger wheels will climb over obstacles that will stop smaller wheels. Pneumatic wheels are similar to car tires and require air pressure to keep them inflated. Solid tires have no need for air pressure maintenance and can be made of many types of material. Some are hard and almost indestructible. Others are made of softer closed-cell foam like what you'll find on a child's tricycle. In fact, 12-inch foam wheels from tricycles may be found at recycling centers for almost no cost. The simplest canoe dolly design has the canoe resting on a cushioned axle. A half-inch-diameter threaded rod makes a good inner axle. Make the axle six inches longer than the canoe's widest width. This extra length is a good idea because it prevents the wheels from rubbing against the canoe. Lock one wheel onto the end of the threaded rod by using two nuts on each side of the wheel. Slide a length of 1-inch PVC pipe over the threaded rod. The pipe will protect the canoe's surface from the threaded rod. Lock the second wheel to the exposed end of the threaded rod, using two nuts on each side of the wheel. If you want additional cushioning, slide a length of 1-inch pipe foam insulation over the PVC pipe. Foam insulation is split lengthwise so it will snap over the PVC pipe. If you position the dolly near the center of the canoe, it will balance and you will not have to carry any of the canoe's weight or cargo. Just pull the canoe by the bow and the dolly will follow. Tony Lolli has written for numerous magazines including Vermont Magazine, The Pointing Dog Journal, ESPNOutdoors.com, Ruffed Grouse Society Journal and Gun Dog. He also writes monthly columns for Northwoods Sporting Journal and Outdoors Magazine. He has had a writer's residency at the Vermont Studio Center. His first book, "Go-To Flies," was published in 2004.